The court of Maximilian II—Holy Roman Emperor and undisputed King of much of Europe—offered an unparalleled opportunity for artistic and musical development: ideas and influences could be widely exchanged in a context of amicable rivalry. Lassus, perhaps the only composer represented on this disc whose name remains familiar to this day, was employed far away from Maximilian’s power base, but his monumental skills were supplied—on secondment, as it were, from Bavaria—to provide the motet Pacis amans in celebration of Maximilian’s crowning as King of Bohemia. What this fascinating programme reveals is how music by Lassus’s lesser-known contemporaries can stand direct comparison with that of the illustrious master. Opening with Jacobus Vaet’s wondrous depiction of the raising of Lazarus, Videns Dominus, the inspirational singing presented here takes us on an exhilarating tour of Maximilian’s bejewelled royal chambers, an environment every bit as opulent and artistically ambitious as that of contemporary Tudor England. Informative—and enlightening—booklet notes by Dr Stephen Rice (also the recording producer) provide the listener with a full guide to the context and sometimes complex interrelationships of these composers whose reputations surely deserve their own bit of the ‘Lazarus effect’. 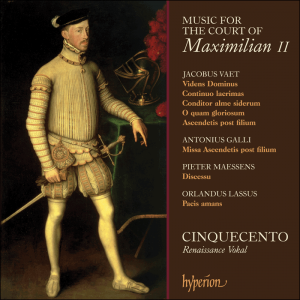 Music for the court of Maximilian II is the debut recording by the thrilling all-male ensemble Cinquecento. Based in Vienna, its six members represent five countries, bringing together and, we believe, truly ‘fusing’ the very best of their respective choral traditions. The results, gloriously captured on tape in the Austrian Dominikanerkirche of Retz, offer an exhilarating new outlook on this rich seam of repertoire as yet largely untapped. Future projects are eagerly awaited, and will include a pioneering survey of music by Jacobus Regnart.